Why Is Big Ben On Every Bottle Of HP Sauce? M@ Why Is Big Ben On Every Bottle Of HP Sauce? No full English breakfast is complete without a generous dollop of HP sauce. The recipe, "made from oriental fruits and spices", goes back to Victorian times, and is attributed to Frederick Gibson Garton of Nottingham. His fruity brown goo was long produced in Aston, Birmingham. So why does this Midlands condiment feature a famous London landmark on every bottle? Well, it's widely agreed that HP stands for Houses of Parliament, hence the illustration. But why name a sauce after the Westminster institution? 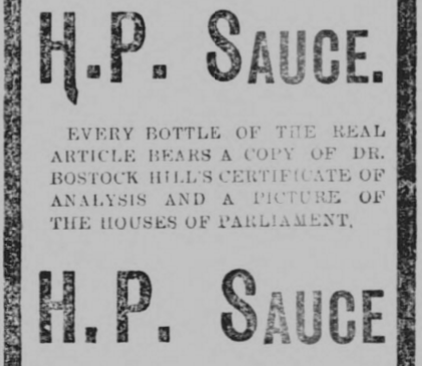 Dr Bostock Hill, incidentally, was a medic who was persuaded to give a testimonial for the sauce. His kind words appeared alongside Big Ben on every bottle. The good doctor opined that "it is of a pleasant and piquant flavour, and is in every respect a thoroughly good sauce". Maybe HP stands for Health Professional. Other origin stories persist, however. 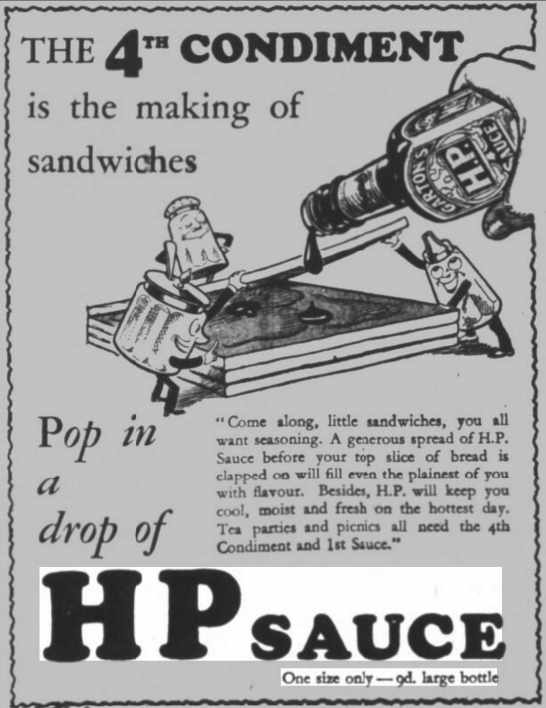 It's sometimes written that the condiment was invented by a Harry Palmer, sold as Harry Palmer's Famous Epsom Sauce, and was then abbreviated to HP. Finding himself in debt (having spent a bit too much time on Epsom racecourse), Palmer sold his recipe to Frederick Garton, who kept the name HP, but worked in the Houses of Parliament connection for wider appeal. This tale appears to be apocryphal. Take it with a pinch of salt. Whatever its origin, HP has long played with its name. Here are a couple of alternative meanings for the abbreviation, dating from the mid-30s. A Harry Potter tie-in must have been tempting for the marketeers of HP. We're guessing the licence was prohibitively expensive. Perhaps they should be talking to the estate of HP Lovecraft. An image of Cthulhu on every bottle could only aid sales. Our absolute favourite advert is from 1934. It not only positions HP as 'the 4th condiment' (alongside salt, pepper and mustard), but it also promises that the sauce will keep you 'moist' on the hottest day. Saucy indeed. Oh, and the artist has clearly never seen a sandwich before. 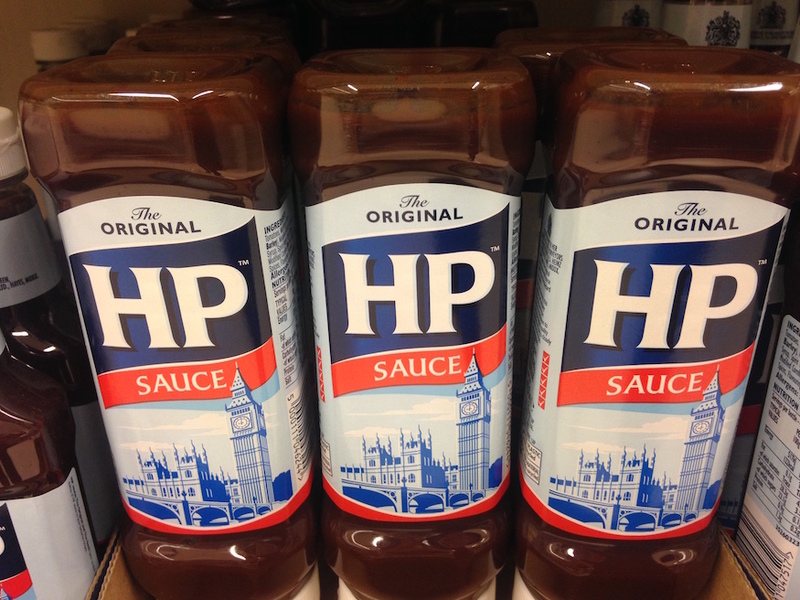 Today, HP sauce remains a staple of the condiment cupboard. The Heinz website reckons that 28 million bottles are consumed each year. "If the bottles were stacked on top of each other," claims the website, "they would reach the same height as 6,189 Houses of Parliament!". We would attempt to verify that altitude, but we fear the steaks would be too high. Adverts taken from the British Newspaper Archive. Copyright, the British Library Board. Unnecessary wordplay by the author. Note for pedants: we can't be arsed to get into the argument about 'Big Ben being the bell, not the tower'. Everyone else calls the tower Big Ben. Deal with it. Why Is There No Charles Dickens Statue In London?